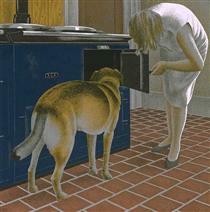 David Alexander Colville, PC CC ONS (24 August 1920 – 16 July 2013) was a Canadian painter. Born in 1920 in Toronto, Ontario, Colville moved with his family at age seven to St. Catharines, and then to Amherst, Nova Scotia in 1929. 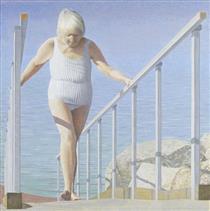 He attended Mount Allison University from 1938 to 1942, graduating with a Bachelor of Fine Arts. He married Rhoda Wright in 1942 and enlisted in the Canadian Army in the infantry, eventually earning the rank of lieutenant. He painted in Yorkshire and took part in the Royal Canadian Navy's landings in southern France. He was then attached to the 3rd Canadian Division. In the army for two years, and because he was a fine-arts student, he was made a war artist in May 1944. His unit relieved the 82nd Airborne Division at Nijmegen, Netherlands in mid-September 1944 during Operation Market Garden and remained there until the following February. He continued on to tours in the Netherlands and Germany, where he was also tasked with depicting the horrors of the Bergen-Belsen concentration camp. 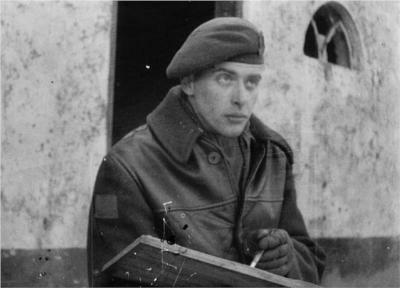 Colville returned to New Brunswick after the war and became a faculty member with the Fine Arts Department at Mount Allison University where he taught from 1946 to 1963. He left teaching to devote himself to painting and print-making full-time from a studio in his home on York Street; this building is now named Colville House. 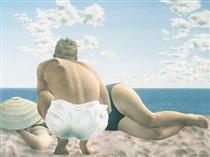 In 1966, works by Colville along with those of Yves Gaucher and Sorel Etrog represented Canada at the Venice Biennale. In 1967, Colville was made an Officer of the Order of Canada, elevated to Companion in 1982, the order's highest level. He lived in St. Catharines, Ontario, for three years before moving to Nova Scotia. 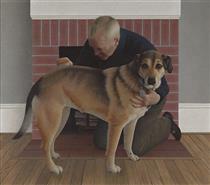 In 1973, he moved his family to his wife's hometown of Wolfville, where they lived and worked in the house that her father built and in which she was born. The Colvilles had three sons, a daughter, and eight grandchildren. In contrast to many of his contemporaries, Colville aligned himself with the Progressive Conservative Party of Canada and was a card-carrying party member for many years. In 1981 he was appointed university chancellor of Acadia University serving in that role until 1991. Colville died on 16 July 2013 at his house in Wolfville at the age of 92 of a heart condition. His wife Rhoda Wright died on 29 December 2012. They are survived by three of their four children, Graham, Charles, and Ann. Their second son, John, died on 22 February 2012. 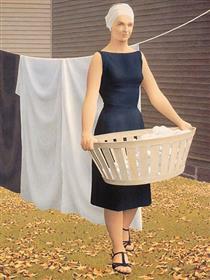 Colville exhibited extensively across Canada and internationally including at the Tate Gallery in London and the Beijing Exhibition Centre in Beijing. 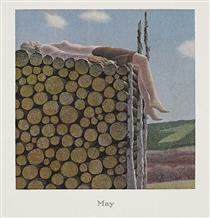 In 1983 an international touring retrospective of his work was organized by the Art Gallery of Ontario. 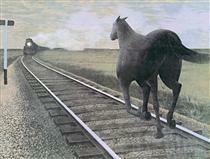 Alex Colville's work is found in many collections including the Art Gallery of Nova Scotia, the Cape Breton University Art Gallery in Sydney, Nova Scotia, the New Brunswick Museum, Saint John, the Museum of Modern Art in New York, the Musée National d'Art Moderne in Paris, the National Gallery of Canada in Ottawa, the Centre National d'Art et de Culture Georges Pompidou in Paris, the Wallraf-Richartz Museum in Cologne and the Kestnergesellschaft in Hanover, Germany.